SpiceJet reported a net profit of Rs.58.9 Crore for Q2 FY 2017 as against Rs.29 crore for the same quarter last year, an increase of 103%. Operating revenue for the quarter stood at Rs.1,400 crores a growth of 35%. Capacity deployed registered a growth of 38% over the same quarter last year. On EBITDAR basis, the Company reported a profit of Rs.333 Crore, a margin of 24%. On EBITDA basis, SpiceJet reported a profit of Rs.127 crore a margin of 9%. Total cost (CASK) declined 10% over the same quarter last year and average unit fares improved by 5% despite competitive pressures. This is the seventh consecutive profitable quarter for SpiceJet after the challenges faced by the Company in December, 2014 and the change in management and control. “This was the weakest quarter of the year and despite the intense competition in the market, SpiceJet has performed exceptionally well. 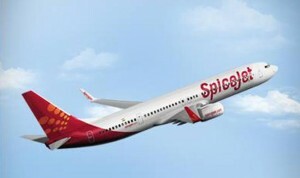 We continue to focus on responsible and profitable growth,” said Ajay Singh, Chairman & Managing Director, Spicejet Limited. “We have resolved practically all our legacy issues and the stage is set for building up our cash reserves and finalising our long term fleet expansion plans,” he added.